Strength, durability and brilliant colors are the trade marks of these rugged, crack-resistant and fade-resistant recycled plastic trash bins. These colorful plastic alternative design trash receptacles will liven up any traffic area. The all-weather polyethylene construction was built to take punishment. These recycled plastic trash bins are available in the colors shown. Model TRS-1 is available with only a single waste deposit door. 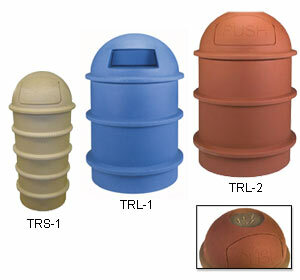 The Model TRL-1 also has only the single waste deposit door and the Model TRL-2 includes an Ashtray Urn and two converse waste deposit doors.